(Annapolis, MD)- On the Chesapeake Bay, “weekend” racing does not stop until mid-December when the first half of Frostbite Season ends. However, the slate of annually run regattas wrapped up with J/105s competing for their Chesapeake Bay Championship and J/35s gunning for a Mid-Atlantic Championship title. Here is the report on the stormy weekend. “With a nor’easter bearing down on us, Race Chair Sandy Grosvenor and Event PRO Steve Kling made the decision to postpone Saturday’s first warning by two hours to allow the sea state to settle in and the predicted 30-40kt gusts to continue northward. The official announcement was posted online and presented to a grateful group of competitors, who were able to bring their crew up to speed in a timely manner. At 1300 the first race of the day kicked off in 20+ kts and 2-3’ swells, but considering how many days we lost of racing this year due to no wind, the conditions were perfect, if not challenging, for a mid-fall championship weekend. The Race Committee ran two races on Day 1 including a five-leg course for race 2, which put the tired, cold, and wet competitors closer to home at the finish line. Day 2, Sunday, kicked off 30 minutes earlier than initially planned to give the Committee a good chance of fitting in three races in a timely manner before sending crews ashore to warm up in the Skipjack for the trophy presentation. With the sun out and the breeze in the mid to high teens, the 1030 warning sent the J/35s and J/105s off on the first of two 4-legged races before wrapping up Race 5 for the regatta with 5-legs and very happy sailors. Topping the podium in the J/35 class was long time fleet member Aunt Jean with Jim Sagerholm and Jerry Christofel. In second place, local J/35 Fleet Captain, Roger Lant on Abientot. Wrapping up the trophy recipient list for the class was member Bruce Artman on T-Bone with Brian Wiersema trimming headsails. To no one’s surprise, Cedric Lewis and Fredrik Salvesen with their long time crew on Mirage once again found themselves on the trophy list for the J/105 class, picking up 1st place for the regatta. In 2nd place, John White sailing with Shane Zwingelberg and Sarah Russell. In 3rd place, Andrew Kennedy’s team on Bat IV. Closing out the presentation was the most meaningful award for local J/105 sailors, as a trophy lost in the fire was adopted by member Andrew Kennedy, Bat IV, and Andy & Leslie Skibo, former owners of Plum Crazy, and presented for the first time since its loss. The Steve Gale Memorial Award was awarded to Mirage’s Greg Larcher. Gale, who passed away in 2010, was a long time bowman for both Plum Crazy and Bat IV, and the trophy was created to recognize the bowman for the top place boat in the fleet’s fall championship. 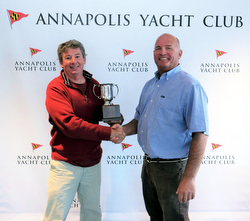 The trophy is now on display in the Clubhouse and will be updated with the winners’ names since its origination.” For more Chesapeake Bay Championship sailing information Add to Flipboard Magazine.